If you want information about the goats, please call Chuda at (802) 825-6626. Chickens come and go so it's best to call Hyacinthe at (802) 829-7371 or Theogene (802) 829-7642 to check on availability. Are you looking for goat meat? Pine Island farm does not sell goat meat but we do sell live goats. Once you purchase a goat at the farm, you are allowed to slaughter it yourself (or bring someone who can slaughter it for you) and return home with the meat. Our goats vary by size and price. In general, seasonal bucklings raised at the farm weigh 60-70 pounds by the Fall. Goats can be purchased by check or cash. We accept EBT and debit card payments as well as checks and cash. We regret that we do not have the capacity to accept credit cards. 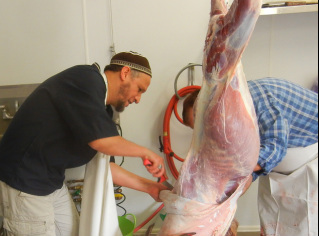 Pine Island Farm only sells animals that will be slaughtered at the on-farm community slaughter room. We do not allow live animals to leave the farm. If we have goats available, you are invited to come to the farm to select your animal and set up a slaughter time. There is a $10 fee for use of the slaughter room, which covers supplies and utilities. Each user is asked to leave the room as clean after use as they found it. Looking to get rid of your goats? Bucklings. Pine Island acquires bucklings in the Spring and Fall. In general, we are only now taking goats from farms who have a minimum of 20-30 bucklings to send our way and who are located within about a 60-mile radius of our farm in Colchester. For the moment we have enough suppliers to meet our needs but if you are potentially interested in working with us at some point in the future, feel free to drop us a line. Adult goats. Do you have adult goats you’d like to sell or give to the farm? We are interested in hearing from you. We are seeking all types of goats, whether male/female, castrated/intact of various breeds and ages. Our only condition is that they be healthy. We can collect from your farm if you are within 50-100 miles (depending on how many animals are available) of Colchester. We will seek to find a mutually fair price for all animals. 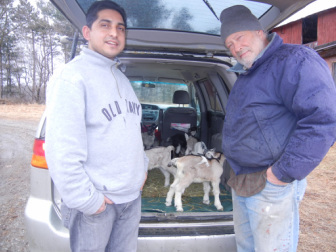 Please contact Chuda by phone if you are interested in supplying adult goats to the farm: (802) 825-6626.